As mentioned in the January 07 “Technical Insights” and in Elden’s February , March, and April “Fuel For Thought” articles, we’ve found a potential problem – and solution – of which most riders may not be aware. We can’t blame you since it’s not even addressed in the factory service manual. The secondary air filter lives under your seat. 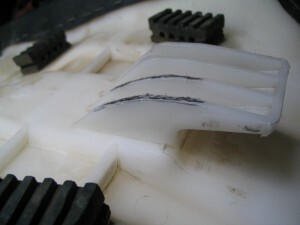 It consists of a piece of foam (which appears to be pretreated by the factory with oil) in a plastic housing, and it’s construction is not conducive to regular cleaning. As mentioned already, the filter is absent from the periodic maintenance section of the service manual. Why then, you might ask, should I be worried about it? Your constant velocity carburetor relies on a diaphram/slide combination to correctly meter fuel. This diaphragm works by moving up and down in response to varying engine demand. The secondary air filter is meant to keep dirt and debris from entering an air hosethat supplies air to the carb that helps modulate the slide. Any dirt or debris that might enter could hinder diaphram/slide movement which in turn reduces your carb’s ability to respond rapidly to changing engine demands. What are the advantages of the Top Gun filter? 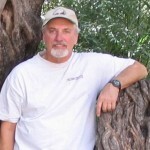 For best throttle response, the diaphram/slide should move as freely as possible. The Top Gun filter does this by providing a much larger surface area for air passage, combined with a filter construction that makes it easy to remove and service. 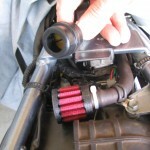 Notice in the top-left picture above how small the opening to the stock air filter is compared to the available surface area of the Top Gun filter. The Top Gun filter element is made of foam so it can be cleaned and oiled with any quality foam filter products. We recommend UNI since they carry a convenient spray-on type oil and cleaner specially formulated for foam filters. Although the service manual doesn’t specify a maintenance interval, we recommend inspecting your secondary air filter every 2,000 miles (same interval as your primary air filter). As we do with our primary air filters, we recommend purchasing two filters. One filter can be installed leaving lots of time to clean the old one. Store your newly-cleaned filter in a ziploc bag and it’s ready to go – just oil and install! Note – If you have a lot of miles, especially in the dirt, on your DR and have never serviced your stock secondary air filter, we recommend inspecting your carburetor prior to installing the Top Gun filter. Installing our filter won’t fix a sticky slide due to pre-existing dirt. Click here to see what happens when your filter isn’t working. Seat tang slightly modified to provide additional filter clearance. Since the Top Gun filter isn’t encased in hard plastic, a few easy steps should be followed to avoid any damage when reinstalling the seat. 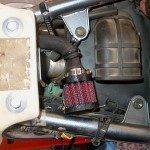 Position the filter as close to the left frame member and airbox inlet tube as possible (see picture top-right). You can adjust the black factory hose-routing clamp to properly position the filter. For additional clearance, we recommend removing some material from the seat tang (see photo right). The filter will fit without this removal, but even shaving 1/4″ makes reinstalling your seat a breeze.